It was just another library day when I was inspired to bake these cakes. My friends A., P. and I were going to the library the other day, and he wanted to get some food so we went to a bakery nearby. 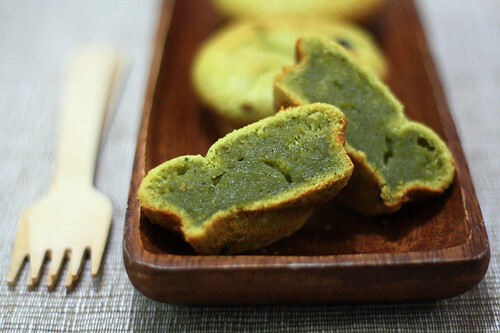 Upon seeing a tray of little cakes labelled 'Green Tea Mochi Cake', it rang a bell in my head - I remembered that I had seen a recipe before for mochi cake! I had a bite of the cake - it had a slightly chewy texture that I loved and immediately proclaimed that I had to recreate the cake. And here it is! Please don't be intimated with the name - it almost seems oxymoronic, as mochi is usually chewy whilst cakes are meant to be fluffy in texture - but it really is the texture of the cake that makes it unique. 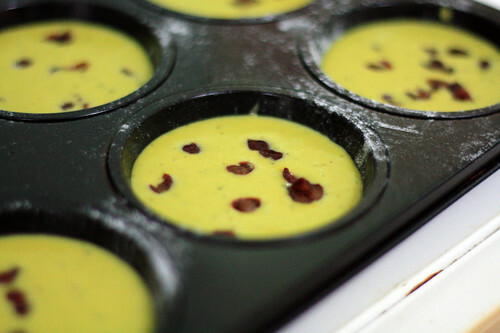 These cakes really combines the best of both Western and Asian dessert worlds - baked in a cupcake pan, it resembles a normal cupcake on the outside. When you bite through, you first break through a layer of fine cake crumbs on the outside, and then your teeth gets to sink into the soft, chewy centre that greatly resembles a Japanese mochi. The red beans dotted within also adds a bit of contrast, lending a mellow sweetness to the cake that blends really well with the matcha. P. also added that the cake's subtle smell of glutinous flour reminded him of traditional Chinese nian gao (the orange rice cakes eaten during CNY). I'm not going to lie, this cake shot straight up to my favourites list upon my first bite; not to boast but I think this version is better than the one from the bakery! I'm hooked and I cannot wait for next week after my French orals where I will bake these again, since mum has alot of glutinous flour left over from making homemade radish cake and nian gao for CNY. I look forward to the sesame/coffee ones! these look nice, I m really curious what these taste like. Pity I don t think I ll find glutinous flour here :( you re awesome! 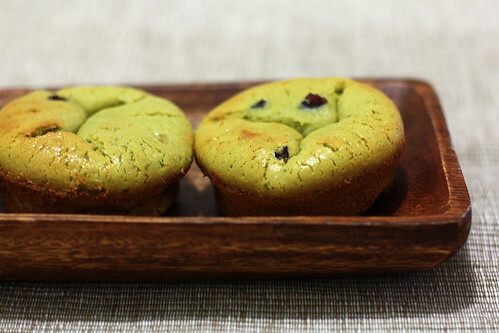 I immediate bookmark this recipe, my family love matcha, maybe I will try to bake this tomorrow.Thanks for sharing. These look so yum! And very nice colour too. love mochi cake. I've tried other recipe before but it took me more than 1 1/2 hours baking time and the cakes are deflated. Definitely will try this recipe. But noted vanilla is not in the ingredient list but it seems to be stated in instruction per point 3. Sorry, I forgot to remove it in the method as I omitted vanilla from the original recipe. Thanks for telling me! Hope your mochi cakes will come out well! Yum! I've made mochi cakes several times but not with matcha...just seemed too obvious I guess ;) They look delicious and now I want some! I love your blog! All the pictures and recipes are fantastic, keep it up! Hi, jump over here fr Sonia's blog. You are really talented. Sonia highly recommended this mochi cake to me. I will definitely have a go as soon as possible. Hi, sorry if this is a silly question, does the skewer have to come out completely clean for me to know if it's cooked, I had it in the oven for 25 minutes but when I tested it with a skewer, a few crumbs and some gooey-mochi bits clung still clung to it, so I left it in the oven for another 5 minutes, but the skewer still didn't come out 'clean'. I took them out of the oven anyway and after they had cooled, I took a bite out of one, and it tasted fine and yummy, so I guess they were cooked afterall? Do you think I should have kept baking them in the oven till the skewer actually came out clean? Thanks. They're delicious! At first, I was hesitant when the batter turned out really watery, but it was love at first bite! I added candied red beans instead of the usual, and it became sort of a filling for the muffin. Fabulous! I would like to try this recipe. Do the cakes keep well until the next day? I plan to bake this tomorrow morning and keep till Monday morning. Please advise. Hi yes they do keep well as long as you keep them in an airtight container or in a ziploc bag. In fact I baked these the night before school and bought them in the next day. Thanks Wendy for the reply. I shall try them this coming weekend. Wendy, I baked the Chocolate Mochi Cakes this morning. Very yummy. Thanks so much for the recipe. 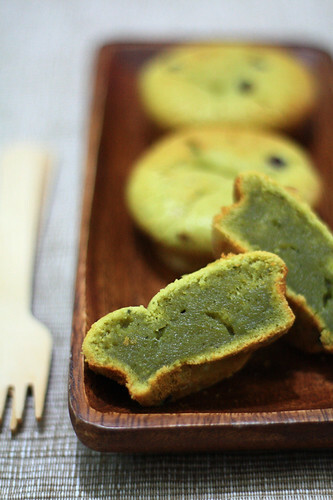 chanced upon your blog from dodol and mochi blog, just baked a batch of the green tea mochi cake and they r now cooling down. couldn't wait and grab one when it was still quite hot. it is delicious! the outside is crusty and inside soft like glutinous rice ball! thks for sharing such an easy and great recipe, i can't wait to try the other flavours! I just have a quick question about your use of evaporated milk in the recipe. Is it there for flavouring or something more important? I want to make this for someone who's lactose intolerant, but I'm worried about that. Would it work if I subbed it with soymilk? Actually I'm not sure, it's probably there as a binding ingredient? From experience evaporated milk is slightly thicker in consistency than normal milk or soymilk, but I assume it would work as well. If you do try it out, let us know how it goes! LOOOOOOOOOOOOOOVE IT!!! 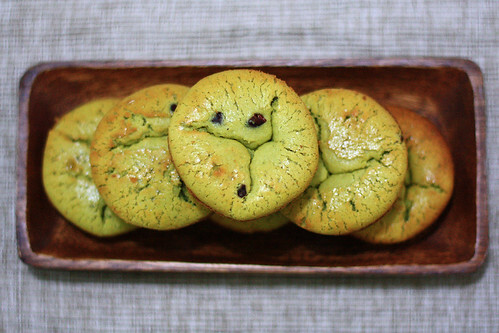 !Thank you so much for a great recipe, I have made them WITH lilikoi (passion fruit), I picked it up while hiking today and decided to try and IT IS OUT OF THIS WORLD!I will try with different filling next time.ALOHA FROM HAWAII ! 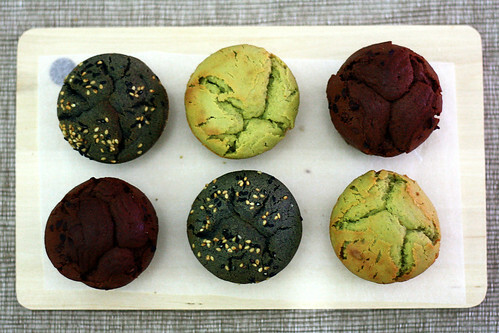 Hi, I just made your matcha mochi cakes for my girlfriends birthday,they came out delicious, but I must say I had some issues converting metric to american measurements.